Pottery Barn Kids twin flat sheet. POTTERY BARN Paisley and Floral KING size Duvet cover. Neutral beige colors. Made in Israel. 100% ORGANIC Cotton. Ties in 4 corners and sides to secure your duvet. Button closure with 9 clear buttons. Beautiful heirloom quality. Very good pre-owned condition. One hardly noticeable, very small repaired tear. It’s very hard to find. Does not detract. Please ask questions before bidding. Thank you. Shipped with USPS Priority Mail. The label says Foundations paradise Duvet housse de couette. It is cotton. It is a bright floral print of lilies, little yellow flowers, ferns, leaves small blue flowers, purple flowers, larger blue flowers. Pottery Barn Naturals Standard Pillow Cases - Set of two organic cotton. They are in their original packaging however I have pulled back the tissue paper to show color. They have been stored and the box has a light stain on the top as shown in picture. Shipped with USPS First Class Package. POTTERY BARN ELISABETTA PILLOWCASES. Color available is FIG. Layer it with other floral bedding or a solid textured quilt to finish the look. 200-thread count. Pottery Barn Queen Duvet Red Putty Floral 88" X 100". Condition is Pre-owned. Shipped with USPS Priority Mail. tths duvet cover is in excellent preowned condition with no dirt, stains or holes. The all cotton fabric still has much of its like new crispness. One side is a floral print and the reverse is a check type pattern as shown. Pillowcases are in good pre-owned condition. And I did find a small mark (see photo 5). These issues are reflected in the price. Retired pattern. Awning Stripe Pillow Shams. Pottery Barn. Material- 55% Linen 45% Cotton. Machine Washable. 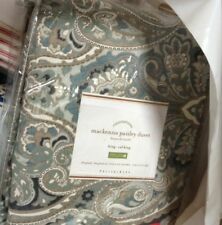 Pottery Barn Mackenna Paisley King Duvet & 2 King Shams. Condition is Pre-owned. Freshly cleaned in packaging. Shipped with USPS Priority Mail. Pottery Barn Linen Euro Pillow Sham. Off white Condition is Pre-owned. Shipped with USPS Priority Mail. I don’t think I ever even used this. Smoke free home. This is for one sham. NEW 2019 POTTERY BARN ESSENTIALS DUVET COVER QUEEN/ FULL FOUNDATIONS WHITE NWT! 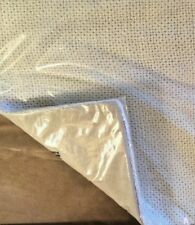 NEW 2019 POTTERY BARN ESSENTIALS DUVET COVER QUEEN/ FULL FOUNDATIONS WHITE NWT!. Condition is New with tags. Shipped with USPS Priority Mail. 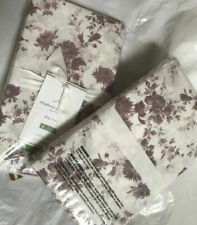 2 Pottery Barn Standard Pillow Shams Flowers. Beige, mauve, pink, green, gold. Please review all pictures before bidding. Thanks for looking. 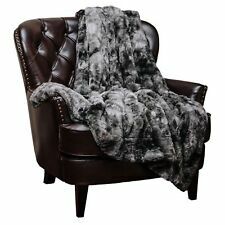 New ListingPottery Barn Faux Fur Gray Tipped Alpaca Throw Blanket ~ 50" x 60"
The short, dense pile takes on a more modern style, and feels alluring when draped over a sofa or armchair. No seriously. I have 19 bottles of Windex and my spices are alphabetized (with front-facing labels, of course! ). 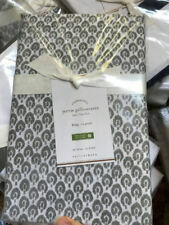 pottery barn king duvet cover set. Comes with king duvet and two standard sized shams. Condition is Pre-owned. Pottery Barn Kids "Monkey's - Pink/Orange" Euro Sham PAIR NEW NO TAGS. Please note the size being 26 BY 26 INCHES. Shipped with USPS FIRST CLASS Mail. FREE MAILING. THANK YOU FOR LOOKING. Darling pillow sham from Pottery Barn. cream with flowers, birds and butterflies. One standard pillowcase featuring hula dancers tropical island surf boards and palm trees. Pottery Barn Kids set of 2 pillow shams. One side navy blue, other side green. Size is 20" x 27". One sham has a VERY faint spot-see photos! Three POTTERY BARN 100 % Organic Cotton Rust/ Green Floral 30 " EURO Pillow Shams. Excellent pre-owned condition. Shipped to continental USA only. Thanks for looking. Pottery Barn LUAU Tropical Beach Hawaiian King Pillow Case. Condition is Pre-owned. Stored in a smoke and pet free environment. White and Blue. Palm trees, hibiscus, islands. Shipped with USPS First Class Package. Freshly laundered and ready to ship. Made in Israel. These are so soft and made with 100% cotton. Your child will love how soft and cozy they feel. Size: Full/Queen Duvet Cover / Standard Shams. Includes duvet cover and 2 shams. Hidden button closure with inner ties on duvet. Duvet: 88"L x 92"W. Envelope closure on shams. Shams: 20" x 26". Floral print. Lichen green. Gently used two-tone silk throw from Pottery Barn. 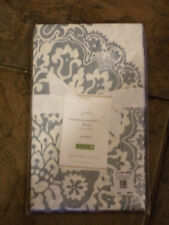 For auction: Beautiful Pottery Barn Light Blue Organic Cotton Blanket King Size . Measures approx 100" x 102". Light check pattern. Blue is almost a light seafoam. Condition is Pre-owned. Shipped with USPS Priority Mail. Model: 3618977. Doing that is against U.S. and international laws. We are not an authorized dealer of this product and any warranty included with the product may not be honored by the manufacturer. Cotton batting. NEW without tags Gorgeous Pottery Barn Solid 100% Linen Flax STANDARD Sham NATURAL. I also have a large Euro sham listed separately that matches this. I am always glad to combine shipping. Pottery Barn King size Fitted Bottom. Organic cotton print sheet. 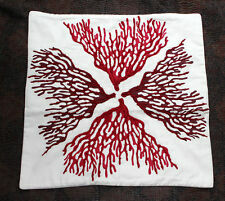 2 NWT's Pottery Estelle chenille Standard Shams! 100% Organic cotton. Be patient for my response. Fabric: 100% Cotton Percale. You are viewing a damask king flat sheet by Pottery Barn. Gold and white damask. Pattern: Damask. Size: King. Model: 7428078. Color: Shale. Size: King / Cal King. Polyester/recycled polyester fill. 100% cotton shell. We are not an authorized dealer of this product and any warranty included with the product may not be honored by the manufacturer. A wonderful duvet cover and 2 matching standard shams. Pottery Barn Teen. Heavy Cotton. Excellent Pre-owned Condition. Color: White. Doing that is against U.S. and international laws. We are not an authorized dealer of this product and any warranty included with the product may not be honored by the manufacturer. Pottery Barn King Size Down Duvet Insert. This Pottery Barn duvet insert is the perfect year round layer! 550 fill power premium White down clusters. 300 thread count. I will always make every attempt to point out any and all irregularities. Pottery Barn White Hadley Ruched King Shams, Set. Condition is Pre-owned. Shipped with USPS Priority Mail. They were only used for two weeks tops no stains smoke free home. Beautiful Pottery Barn 2 KING SIZE Pillowcases. I believe they are EVELYN Pattern. Gorgeous New UNUSED.2 King Size. 100% Cotton. Thread Count: 400. Includes: flat sheet, fitted sheet and 2 pillowcases. Fitted Sheet: 60" wide x 80" long. Flat Sheet: 96" wide x 105" long. Fabric: 100% Cotton Percale. Care: Machine Washable. Organic cotton. 200 thread count. Size: Full. Color: Multi. We are not an authorized dealer of this product and any warranty included with the product may not be honored by the manufacturer. Doing that is against U.S. and international laws. Pottery Barn Off White Linen Farmhouse Standard Sham. Condition is Pre-owned. Shipped with USPS First Class Package. Displayed for just a short time. Smoke free home. Potterybarn King Duvet Braid Nautical Rope. Condition is Pre-owned. Shipped with USPS Priority Mail. Duvet in beautiful condition. Buttons all good threads are little lose on some . There are no stains no holes. Navy blues white rope type pattern thru out. Pattern on both sides. 5% organic cotton. Pottery Barn Orchid Duvet Full/Queen. Condition is New with tags. Shipped with USPS Priority Mail. Ivory botanical print with accents of yellow and green. Full/queen size measuring 92 x 88 inches. Button closure at foot. Brand new - never used. Supersoft and with a subtle sheen, this quilt and sham feel luxurious. The reverse is woven of eco-friendly Tencel™, making this bedding breathable and naturally wrinkle-resistant. Quilt and shams reverse to contrast color. Duvet features a hidden button closure with inner ties that keep insert in place;. Front fabric is made of a 45% rayon, 38% cotton and 17% linen blend. Reverse fabric is 100% cotton. NOTE: I take pictures to show the design, NOT SIZE!